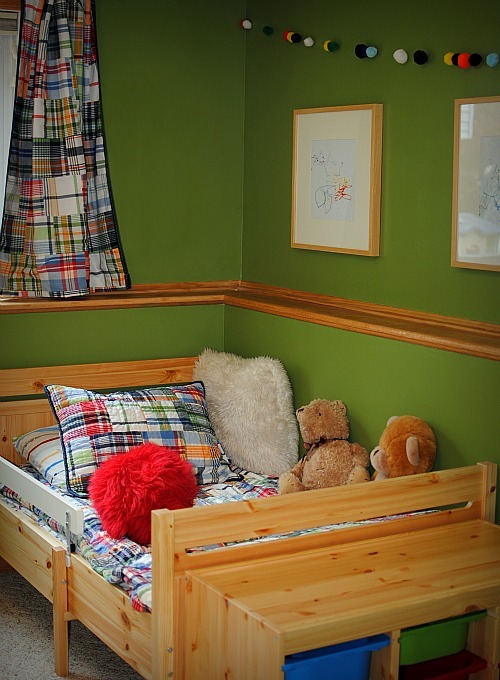 As my husband dragged perilously heavy furniture down our staircase this past weekend and I cheered him on in my heavily-pregnant state, I imagined writing this post with a completed toddler bedroom. Additionally, I was planning to have the new baby's room set up and hoping to throw in a few pictures of the new and spider-free master bedroom. But then I remembered that I have a toddler and I quickly came to my senses. So, today you're not going to see the finished toddler bedroom. You also won't be seeing pictures of the small landfill I created in our backyard after utilizing fistfulls of toilet paper to eradicate the colony of spiders in my bedroom. But that's mostly because I didn't have a zoning permit for that and the Russian couple that live just behind us apparently take issue with the whole concept of private property. Lucky for all of you, I am ready to reveal a bit more of the progress we've made in the past few days. Unfortunately, I use that term loosely due the the fact that these photos were taken in the afternoon which also coincides perfectly with the time of day just before I royally screwed up one of the bedroom walls with a failed shelf installation. Note to self: BRIBE HUSBAND DO ALL FUTURE INSTALLATIONS. Kicking off the preview is a bit of the art I decided on for Nathaniel's room. While I spent hours scouring the dark and scary corners of the internet looking for exactly the right prints to fill these frames, I never quite found what I wanted. So I chose the credit card-friendly option, toddler art. 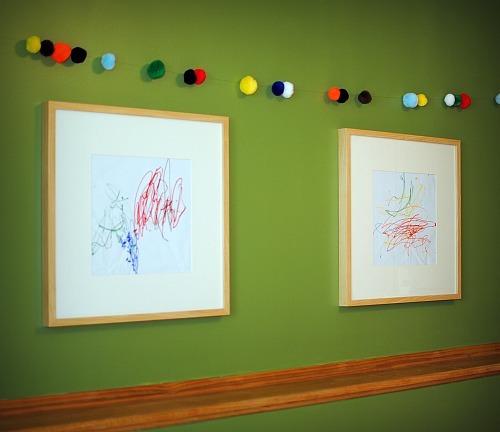 Nathaniel had a lot of fun creating the masterpieces that now hang on his walls and they will be great to look back on later as seventeen-month-old drawings. 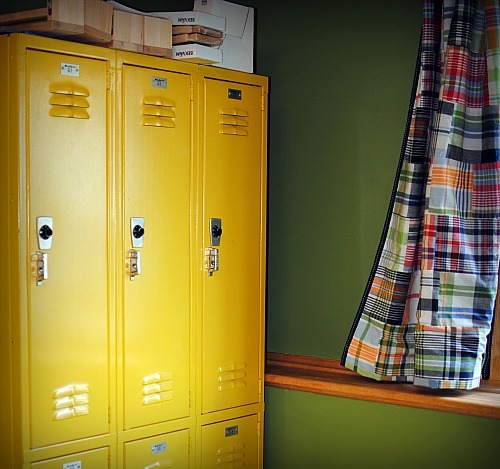 One of the best finds I ran across for the toddler's new room was a set of school lockers. After scouring Craigslist for weeks and resolving not to buy brand new ones which would require freight shipping from Utah and selling a kidney on the black market to cover the bill, I finally found exactly what I wanted. The best part? They were an amazing deal and didn't require any surgery. Moving Nathaniel down to his new room also required moving the baby monitor. While it had previously been sitting on top of his bookshelf, I had plans for this high-tech piece of equipment. Thanks to my husband and father-in-law who were an unstoppable force of nature on Sunday, this was one of many house projects completed. 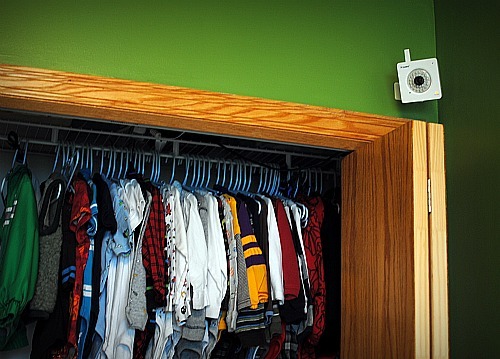 And due to their ingenuity, it plugs into a brand new outlet on the inside of the toddler's closet that is well out of his reach. At least until he learns how to climb onto a chair. So after rearranging furniture and toddler-proofing the tetanus and strangulation hazards in the bedroom (also cleverly known as a cable jack and cord for the blinds), we were left with a livable space for our little boy. There's definitely still work to be done, but we're tackling it as quickly as possible knowing that our time is limited. August is looming on the horizon and, let me assure you, the nesting urge to have everything perfect and welcoming for the baby is in full swing over here. But despite all the pregnancy urges in the world, I won't be installing any more shelves in the near future.